"I was rambling around, looking for subjects for the TDS Photo Assignment when I came across this window," said Mark Given. "Odd little storefront building with other flags behind other windows, too. I was struck by the contrast between the 'Americana' montage created by the flag/building/trees reflection, and the concept of a flag behind glass. 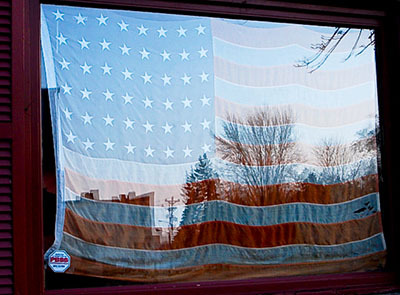 Is it a patriotic display or a simple curtain, keeping us from seeing inside?" It certainly is a sign of the times right now in the States. Mark used a Nikon D80 with the lens set to 28mm and the ISO at 400. If you have a candid you'd like to share, take a look at our Submissions page, then send us your Grab Shot. We'll try to get it published for you on The Digital Story. And you can view more images from our virtual camera club in the Member Photo Gallery.